The Dutch loved paintings. 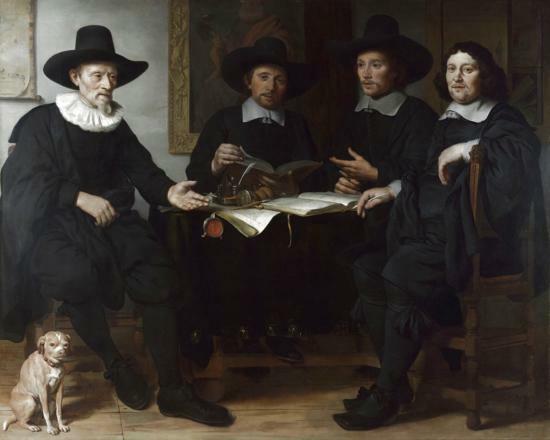 The 17th century was an age where paintings were not solely the possession of the wealthy. Many different types of people could afford paintings and as a result a wide variety of genres were painted. The paintings featured in this post all contain wine related items or people. David Teniers (1610-1690) was a painter of peasant life. This painting is part of the group, The Four Seasons. Is shows a drinker raising a glass of wine. This painting is by Gerbrand van den Eeckhout (1621-1674) who was a student of Rembrandt. 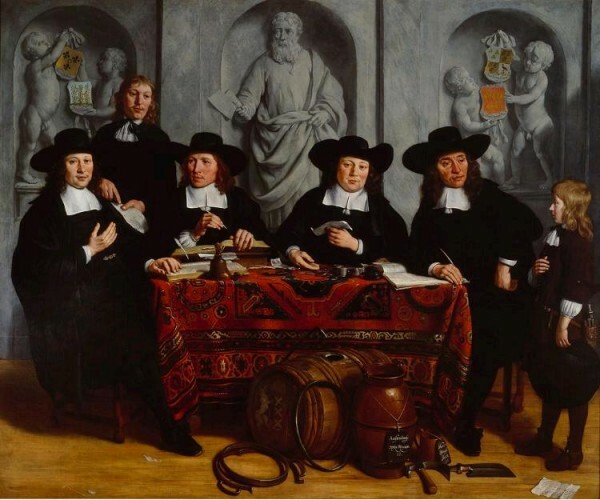 The painting shows the officers of the guild that made the wine barrels for wine imported into Amsterdam and who also tasted the wine. The painting is of Saint Matthias who is the patron saint of the coopers. There are cooper’s tools on the table. This painting is of the same subject but from 15 years later. The painting shows the officers of the Cooper’s and Wine taster’s guild. This type of painting showing the officers of a guild were very popular. 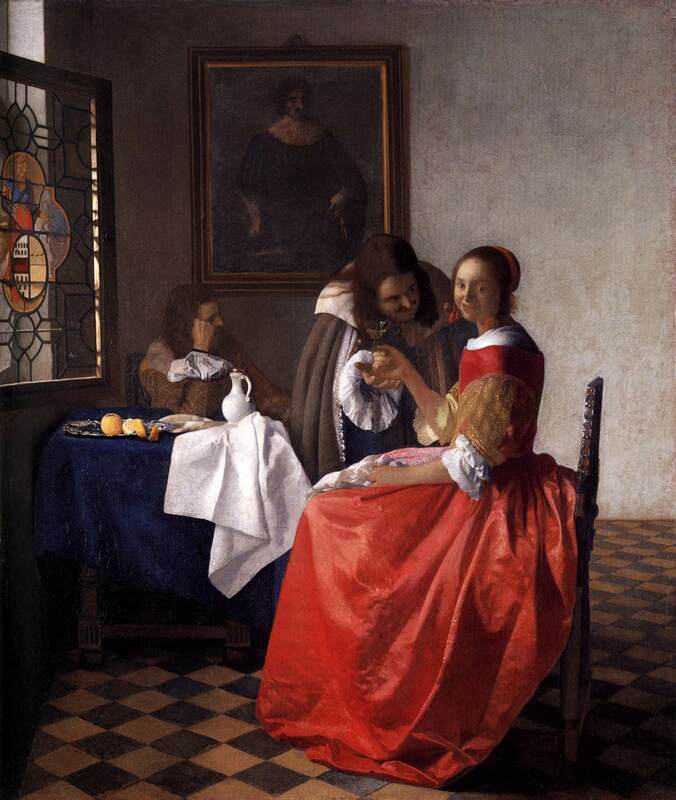 Johannes Vermeer (1632 – 1675) is considered one of the greatest Dutch painters. This painting shows a well-dressed man watching a woman finish her glass of wine. He has his hand on the wine pitcher, as if ready to fill her glass. On the chair is a musical instrument called a chitarrone. The couple are quite formal in expression. 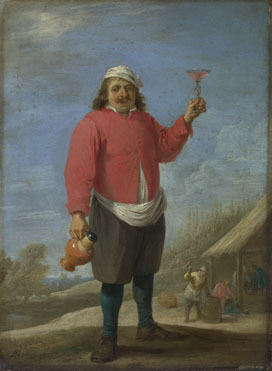 This painting shows a well-dressed man supporting the woman’s hand which contains a half-full glass of wine. He is intensely watching her face. She has her head turned towards the viewer and is smiling. The man in the background is brooding with a pitcher of wine and peeled citrus fruit. It is the same pitcher as in the previous painting. 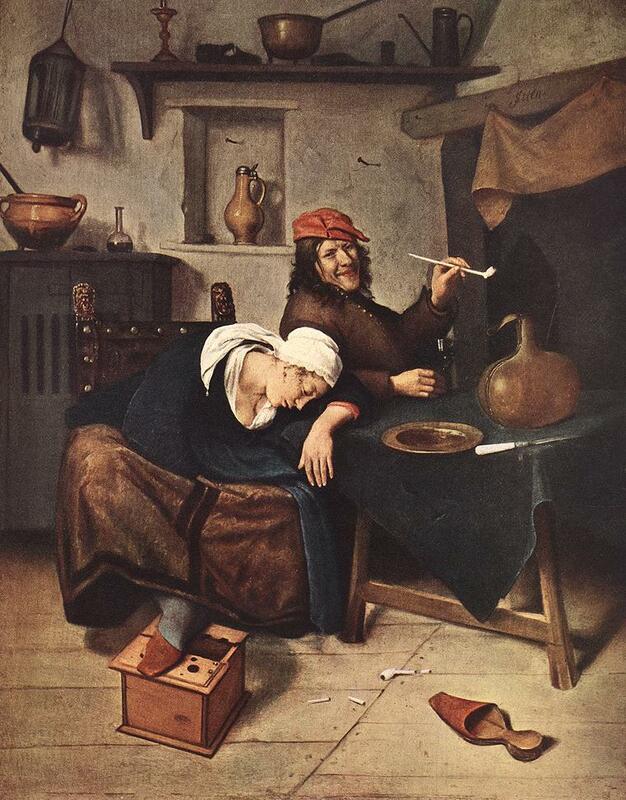 Jan Steen (1625/1626-1679) was the son of a brewer and grain merchant. He married Margaretha van Goyen in 1654. They moved to Haarlem in 1661 where he produced many painting including this one. His wife died in 1669 and one year later he moved to Leiden after inheriting his father’s house. In 1672 he received a license to open an inn. He often included his self-portrait. 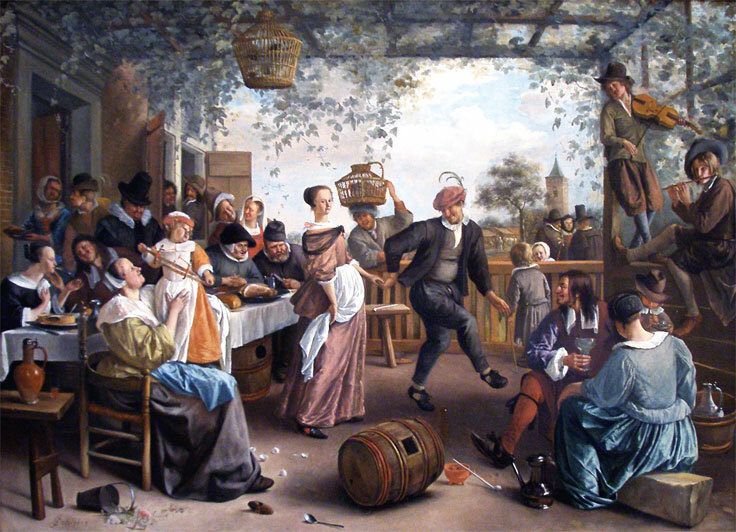 This painting shows a group celebrating at a tavern. In the center are a young couple, a finely dressed girl and a country boy. 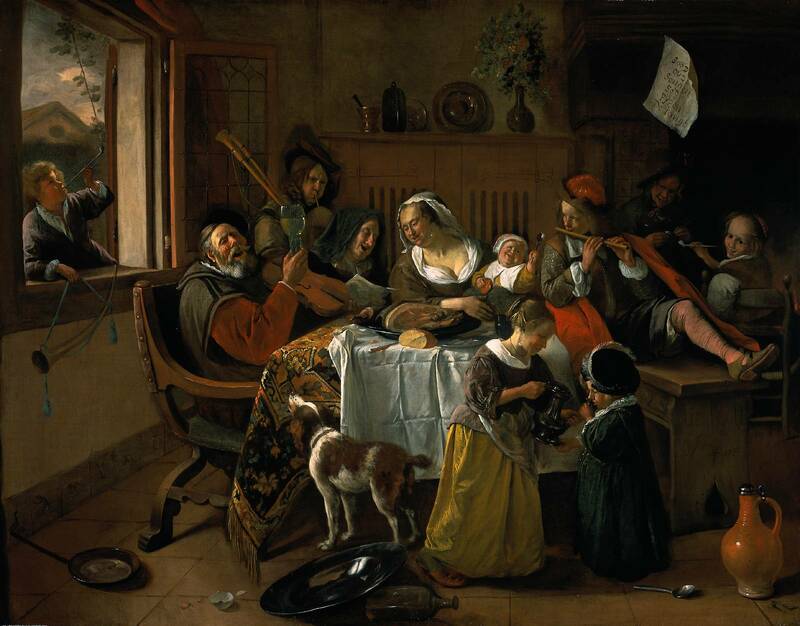 Jan Steen is seen tickling his wife at the very left of the banquet table. According to the National Gallery of Art’s “Dutch Painting” instructional book, the empty wine barrel in the foreground symbolizes the saying “A full barrel does not resound.” A wise person acts in a respectable manner where as the words of the ignorant echo hollowly in the air. This painting shows a large family of grandmother, parents, and children around a table. The grandmother and mother are singing, two sons are smoking a pipe, another son and daughter are playing music, the father has just stopped playing music and is raising his glass of wine, while the young children standing are drinking wine. This painting has a moral admonishment written on a piece of paper pinned to the mantelpiece. According to the Rijksmuseum it reads d’Oude Songen, Soo Pypen de Jonge “As the Old Sing, So Pipe the Young.” In other words the children will follow their parent’s bad behaviors. This painting is a self portrait of Jan Steen and his wife Margaretha. He frequently included his self-portrait and which tend to show a bit of self-humor. He was credited with a like for drink but perhaps this is simply due to his running an inn. Willem Claesz. Heda (1594c – 1680) was a master at reflections. 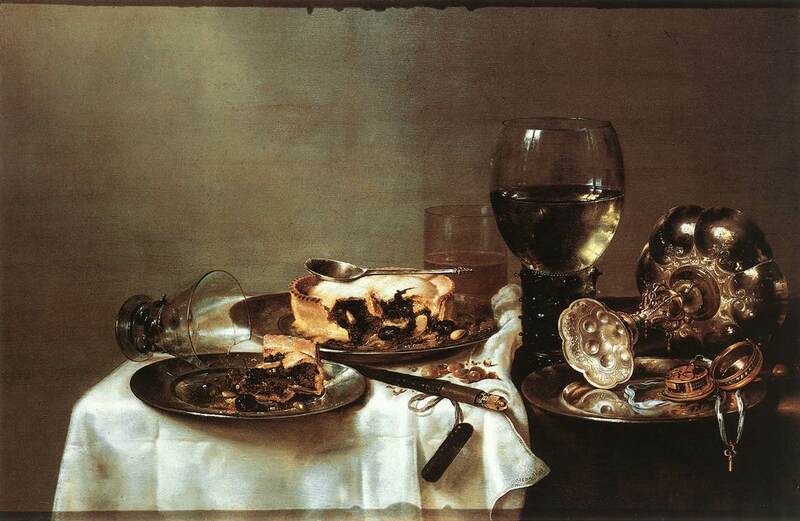 This painting shows a partially eaten blackberry pie on a tablecloth pushed to the side, an empty, broken wine glass rests on a plate with a slice of pie, nuts, a glass of wine, perhaps a glass of beer, a tipped over chalice, and a clock. Floris van Dijck (1575 – 1651) was a painter acclaimed for his natural depictions. This painting shows a fancy table with a damask tablecloth. 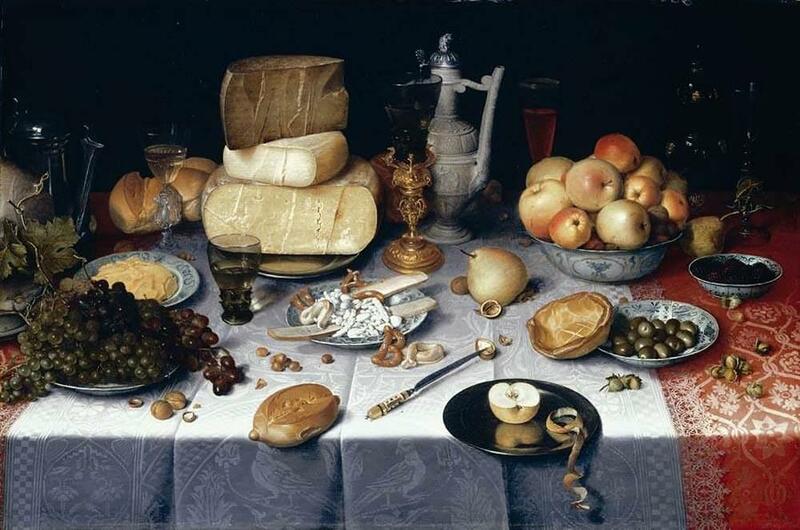 On top are piles of cheeses, fruits , olives, nuts, grapes, bread, a several different types of wine glasses, different types of pitches, crumbs, and a half of an apple with a peel. 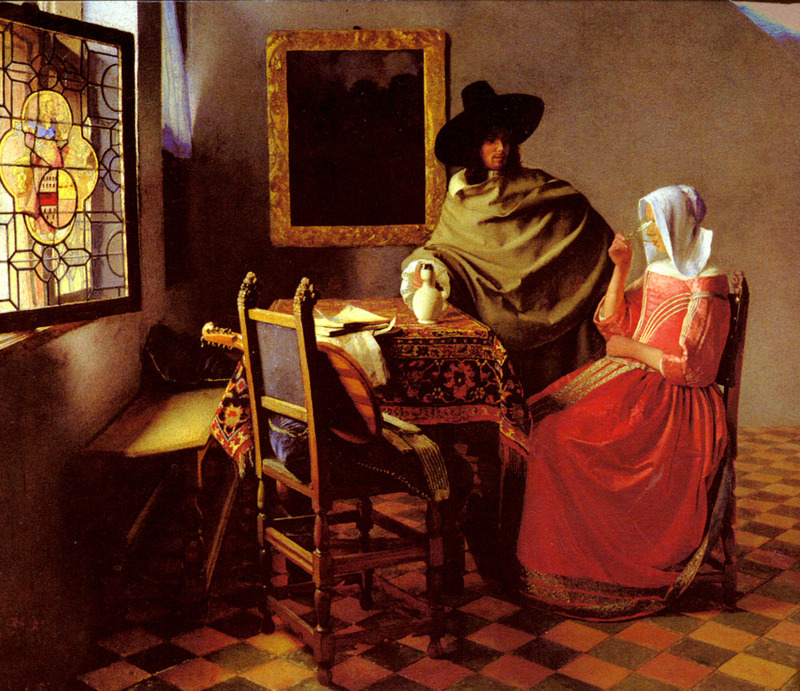 This type of breakfast painting is known as ontbijtgen. Pieter Claesz (1596/1597-1600) is considered one of the most important Dutch still-life painter. 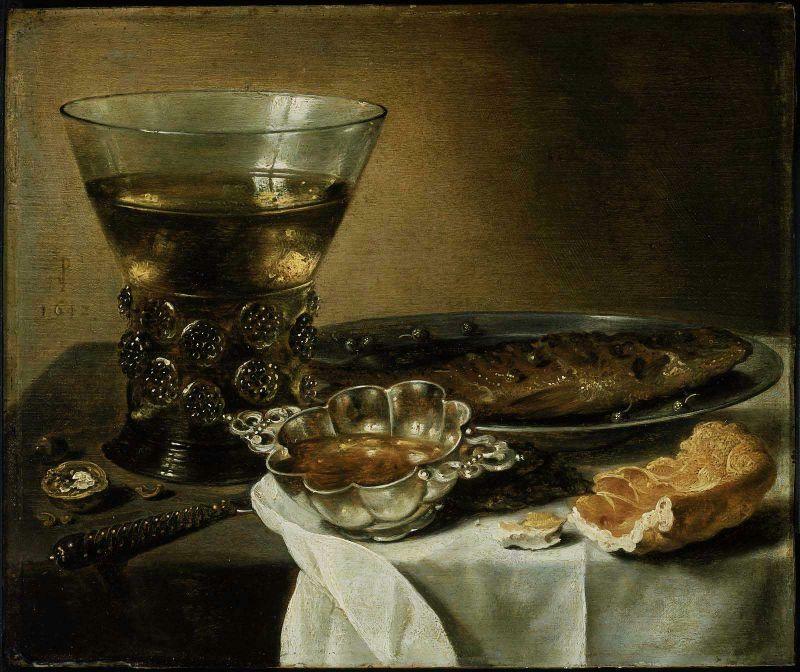 This painting shows a filled glass of wine, a knife, a partially eaten walnut, a herring, silver brandy bowl, and a partially eat piee of bread. There are crumbs on the table and the table cloth is askew. Willem Kalf (1619-1693) worked in Paris before settling down in Amsterdam. He painted rustic interiors and farm yard scenes before moving to pronkstilleven. Pronk means “ostentation” and these ostentatious paintings became popular in the 1650s. This painting is centered around a glass of wine and shows three oranges and a lemon. The sweet and sour fruits suggest that the view remain temperate. The partially peeled orange suggest that one add orange and lemon juice to the wine for medicinal purposes. 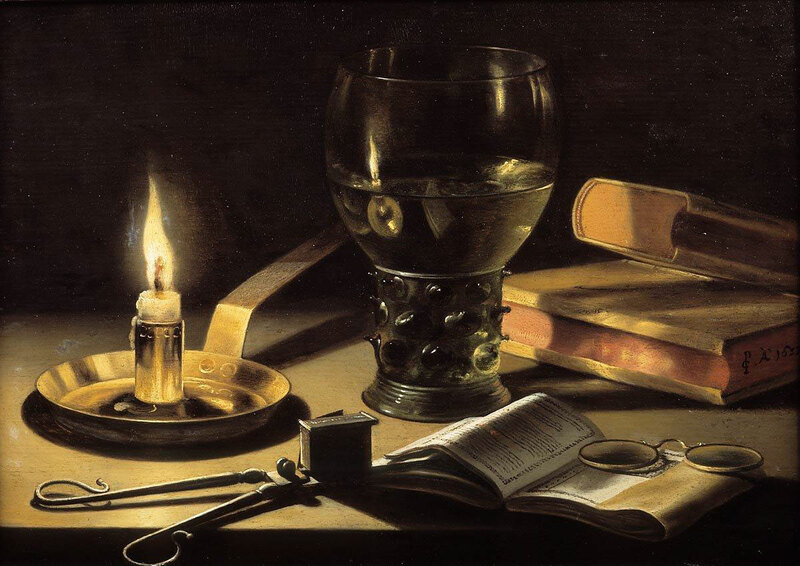 This painting shows a burning candle, snuffer, a glass of wine, several books, one of which is open, and a pair of spectacles. Claesz developed the dark, monochrome banketjes or table top still life. “This painting looks like a combination of several smaller still lifes. In the foreground, to the right, are a number of musical instruments. They are lying beside a piece of armour and various books. More books are shown on the table, along with a plaster statue, some bones, a skull and various artist’s materials. From the skull and bones, it is clear that this painting is about transience, or vanitas.The watch and the fading oil lamp refer to the passage of time, while the musical instruments symbolise the ephemeral nature of music. 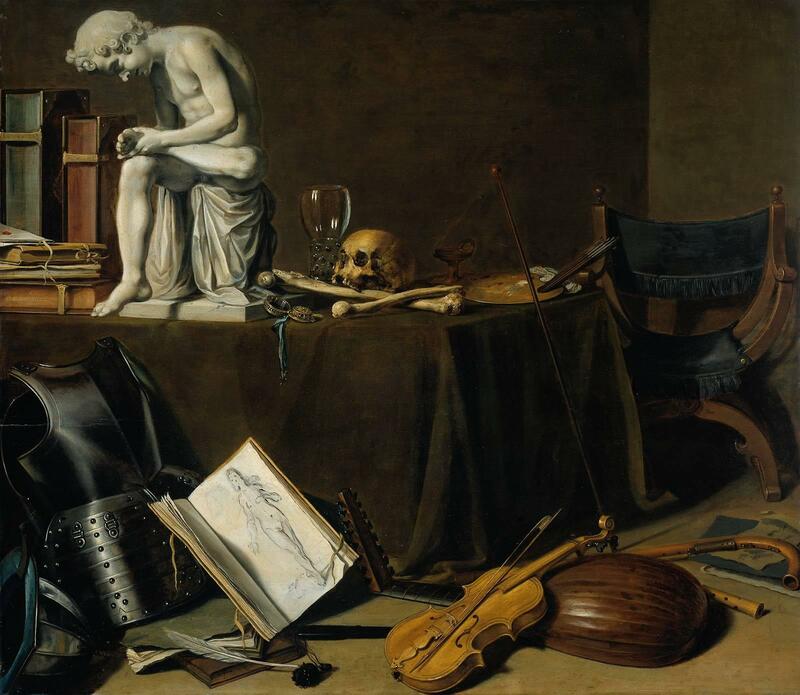 Vanitas is related to the word vanity and to transience. The term refers to the opening verse of Ecclesiastes in the Latin Bible ‘Vanitas vanitatum, omnia vanitas’: vanity of vanities, all is vanity. 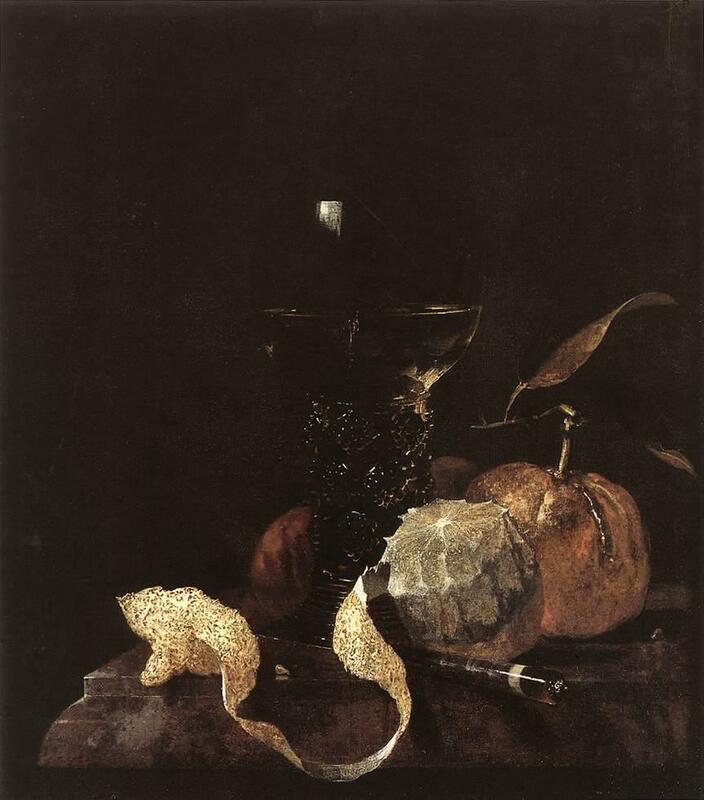 Seventeenth-century Dutch paintings often feature symbols of transience, especially still lifes. Skulls, hourglasses, extinguished candles and similar elements refer to the evanescence of existence. 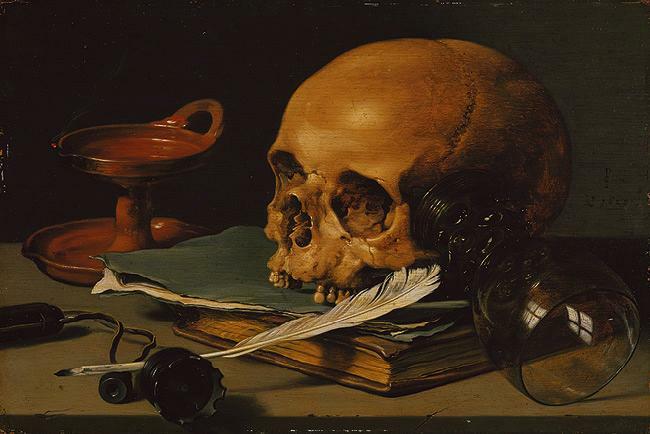 Vanitas paintings are intended to remind the viewer of how short life is and that it should be lived with due regard to God’s laws.” Source: Vanitas still life, Rijksmuseum Amsterdam. “This is one of the earliest dated still lifes by Claesz., a Haarlem painter who gave extraordinary presence to familiar things. Here a skull, an overturned glass roemer with its fleeting reflections, an expired lamp, and the attributes of a writer suggest that worldly efforts are ultimately in vain.” Source: Pieter Claesz: Still Life with a Skull and a Writing Quill (49.107) | Heilbrunn Timeline of Art History | The Metropolitan Museum of Art. Really very nice collection of painting and related information. Thank you very much. I picked paintings that were of particular interest to me. Really Aaron your blog is fantastic. Paintings are amazing. I remember the old fashioned culture. and last painting is little bit horrible.. but nice.. Refreshing way to appreciate both wine and art!